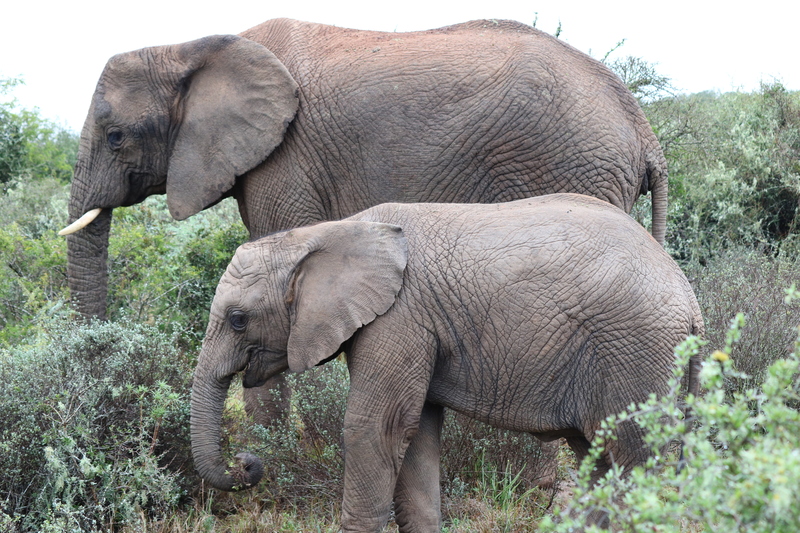 There can be no doubt that the highlight of our trip to South Africa was our safari experience. 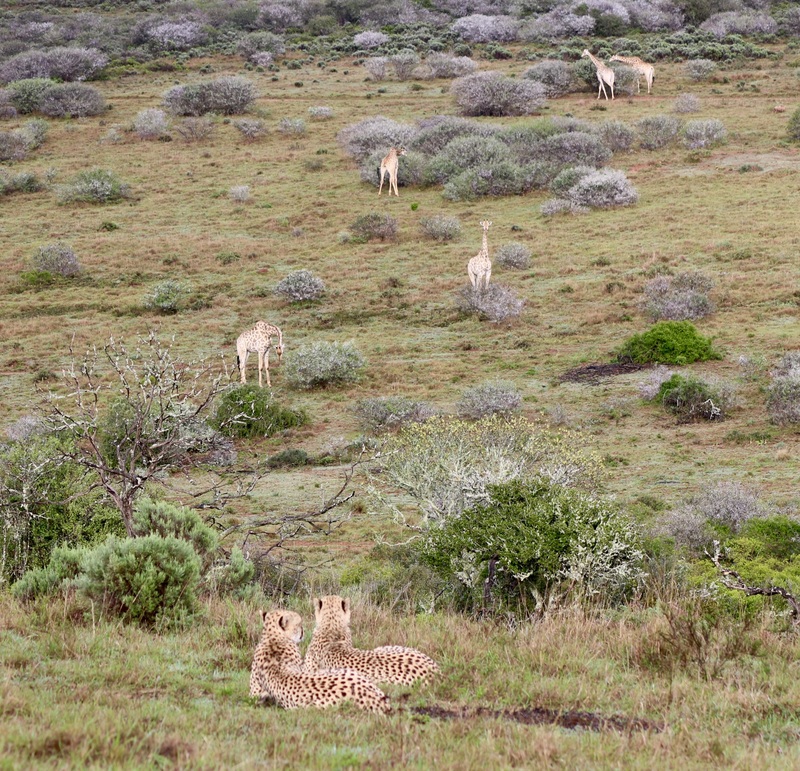 That is not to diminish the beauty of the the other areas we explored but to come face to face with with the beings who freely roam the reserve, is an opportunity of a lifetime & one we will never forget. Shamwari provided us with an up close & personal experience, often finding ourselves within such close proximity, we could have reached out & touched the animals we were viewing. 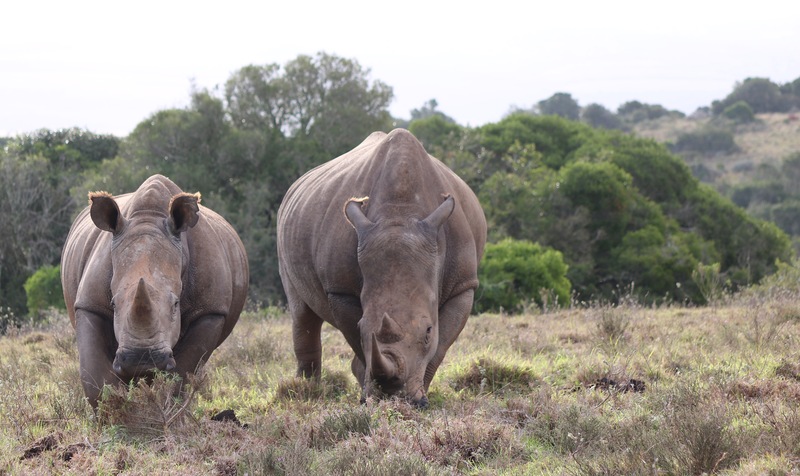 We did not, for one of the things we loved about Shamwari was the very strict guidelines with respect to protection of flora & fauna on the reserve. As we set out for our first game drive, we were met with a fairly substantial downpour of rain. These are the kind of unpredictable moments in travel where you can either allow the situation to cause you stress or you can opt to just go with it. K & I exchanged a mutual shrug of the shoulders, a kind of an “oh well, we’re going to get wet” look & added a few more layers. We were in Africa afterall, living out a dream we had dreamed of for some time. No amount of rain was going to dampen our spirits. We had barely made it out of the drive before seeing some giraffes loping across the road. They are such interesting creatures to watch, almost dinosaur like in their size. 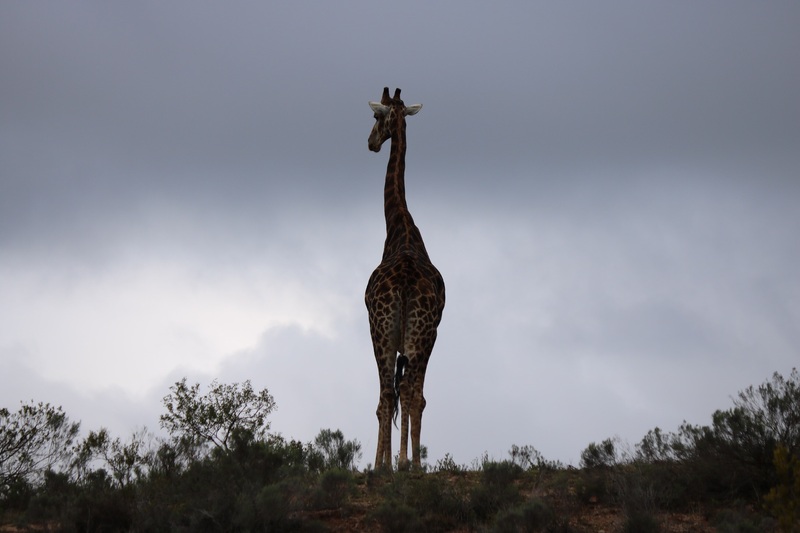 Love how this giraffe looked against the darkening sky. 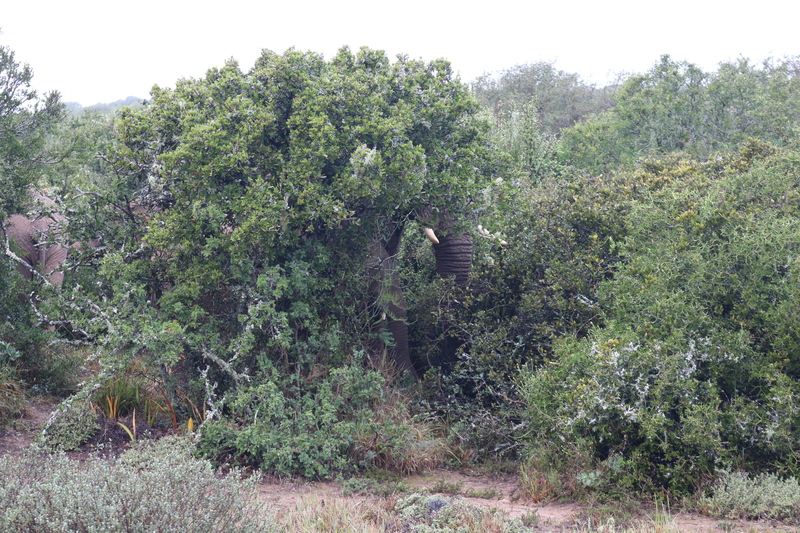 Moving further into the reserve, we kept our eyes peeled for any wildlife. 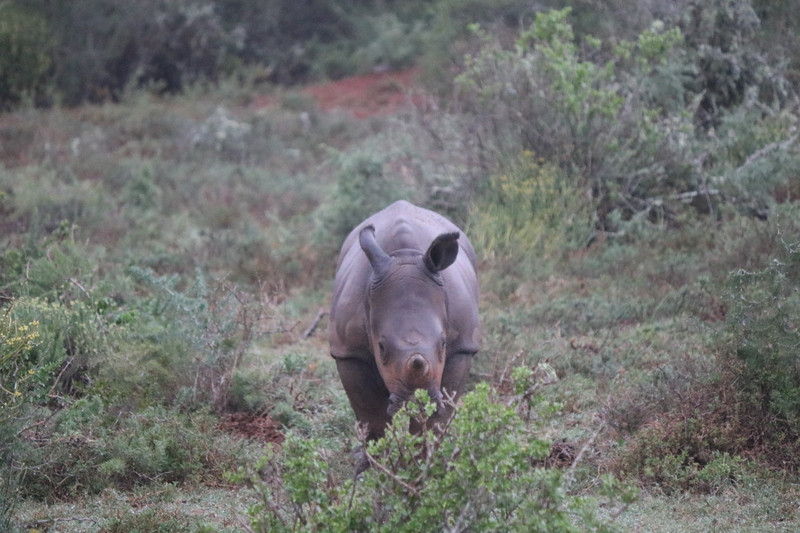 Clearly our ranger was much more adept at doing this than we were as we would have passed right by this beautiful creature without even realizing she was there! At the outset of a safari experience, guests are given a run down of dos & don’ts, both for the protection of the people in the vehicle, but also for the protection of the animals who call Shamwari home. One of those instructions was to try to refrain from gasping or shouting when spotting an animal, thus sending them fleeing in fright. This can prove more challenging than one would think. It was difficult to suppress startles of surprise as we rounded the corner & came to a halting stop to allow our friends to cross. 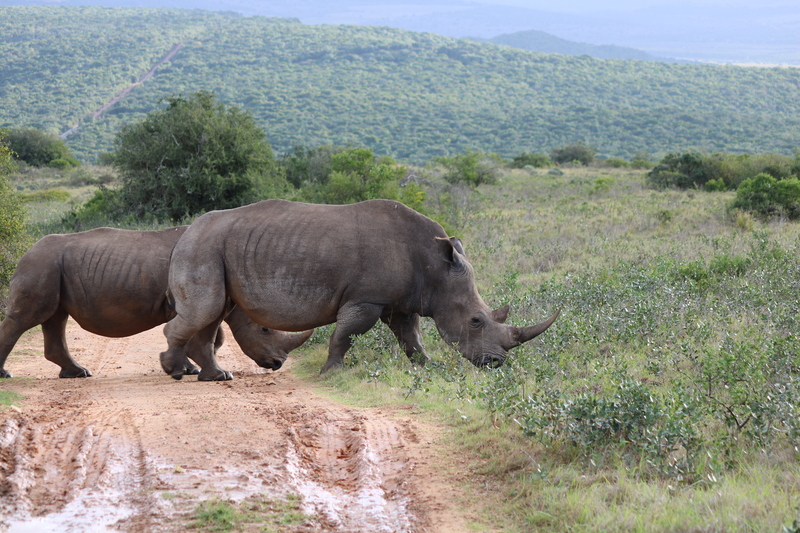 Giving our friends, the white rhinos, the right of way. 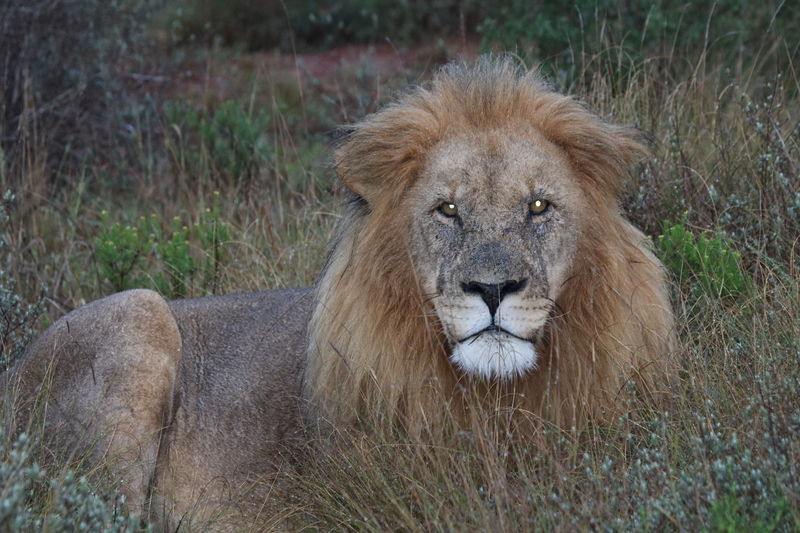 Receiving word through the radio from a fellow ranger of a sighting of the eldest male lion on the reserve, we opted to make our way to that area in the hopes of getting a glimpse of this beautiful guy. It surprised me how camoflauged he was, sitting contently in the rain. With his colouring, he quite easily blended into his surroundings, seeming very uninterested in us as we approached. 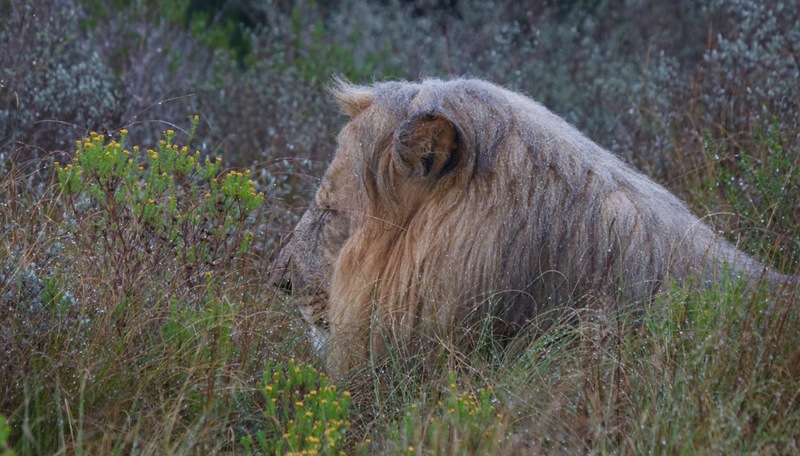 It was only when he gave his mane a good shake that he really took any notice of us at all, most likely because we were interupting his nap! After giving his mane a shake. Moving along, we ran into these two, leisurely grazing on the land. Mom & baby went about their grazing, as we sat quietly taking in their movement, giving us an opportunity to snap a few pictures, before they moved on. 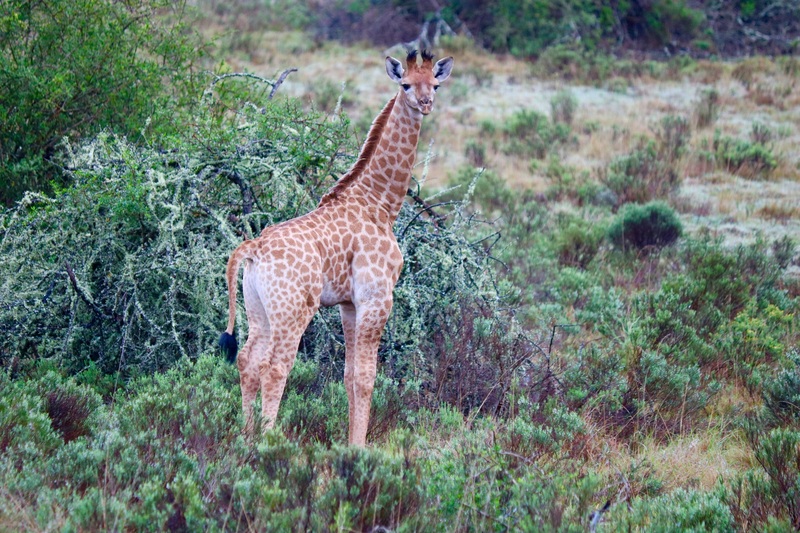 Squeals of delight were difficult to control when we came across this baby giraffe. Our ranger estimated him to be not more than a few months old as he still had his umbilical cord hanging from him. If you look closely, you may be able to spot it in the 2nd picture. Standing with Mama gives you a little better idea of his size. 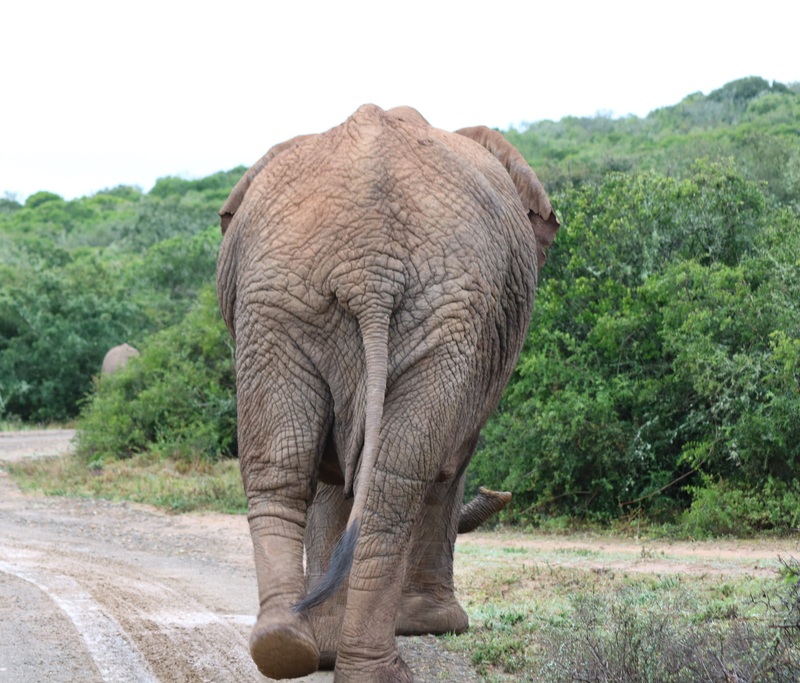 Imagine our surprise when we came upon this rear end, quietly lolling along the road! Elephants are such fascinating creatures to observe. 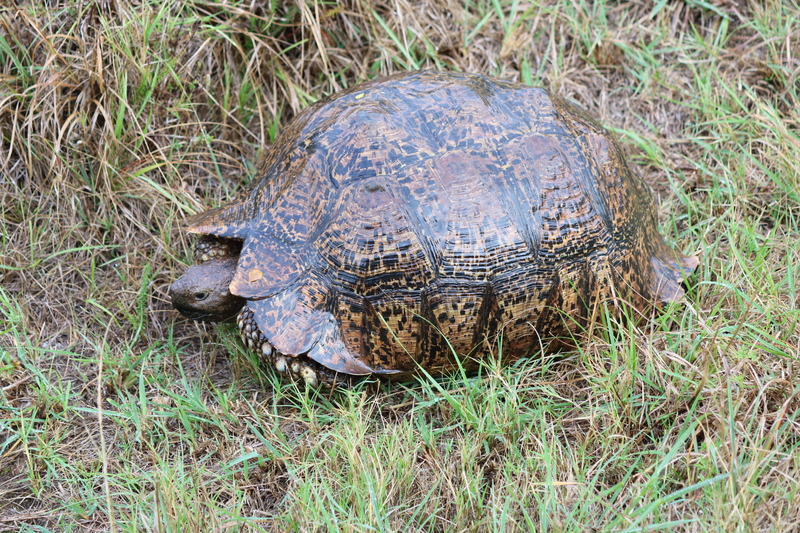 It was surprising to learn how very quiet they are as they move through the bush. With the exception of the snapping & cracking of branches, one would never know they were there. Just when we thought we couldn’t possibly see more than we had seen that evening, we had one last sighting before heading back. If my memory serves me correctly, I believe these two cheetahs were mother & son. There are simply no words to describe the feeling of coming face to face with any one of the animals we came across that first night. To have the opportunity to sit quietly & observe them in their natural habitat truly left us in awe & at times, absolutely speechless. This entry was posted in Uncategorized, Wanderlust and tagged Gratitude, South Africa, travel. Bookmark the permalink. Beautiful photos. I love the baby giraffe. So odd to think that you saw these “zoo” animals in the wild, but glad that you did. And that you took your camera with you! Thanks Ally. 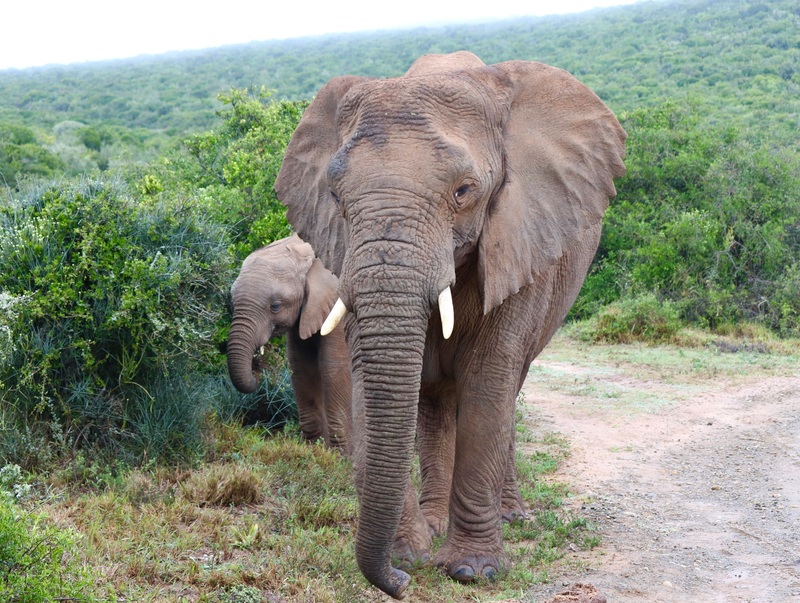 It was such an incredible opportunity to visit South Africa & the safari was absolutely the highlight! I can see why it was the highlight. Way cool. Fabulous photography! 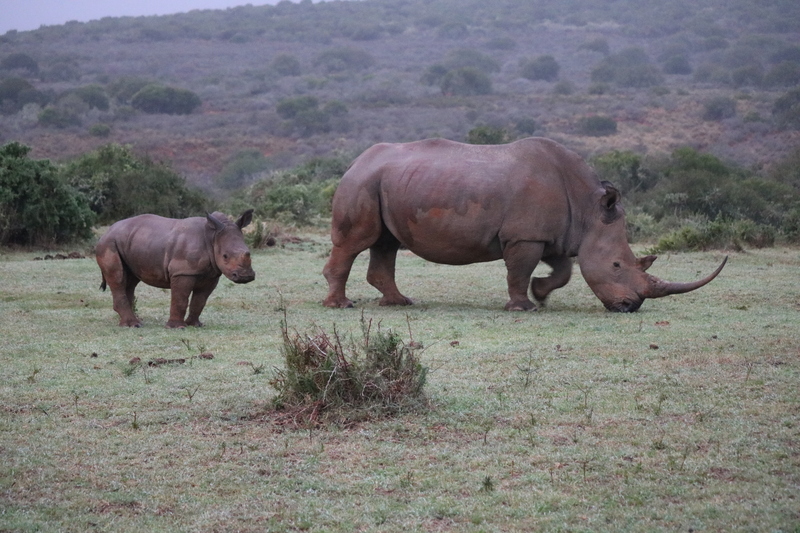 I don’t know what this says about me, but the hind shot of the mama and baby rhinos appeals to me most! Though they are all terrific. That’s so funny you say that Maggie! You & I share the love of the hind shots for I too, am always drawn to them. Thanks so much for reading! [giggle] Phew! Glad to hear I’m not alone! Wow, that is such an incredible experience! The pictures are stunning – you were really up close and personal. Love, love the baby giraffe. Great job on the pictures! Lynn I could barely control my gasping just looking at the photos! Oh my goodness these are incredible! What a wonderful post to read as we get ready to head on our way. Loved it!! Sue, you will have to get used to controlling that gasping when you go on safari! Again, have an amazing time my friend! I feel like I will constantly have to have my hand over my mouth! Happy to share Clifford! It was a dream come true for me to visit a small part of Africa. I would love to go back some day. Amazing photos! That truly would be a trip of a lifetime – and I hope my lifetime will include an adventure like that too. It’s hard to understand why anyone would wish these creatures harm. Fortunately, they are safe while within the confines of the reserve. You are too kind! I have dreamed of this adventure for many years, to have experienced with my grown daughter let my heart overflowing. I would highly recommend this destination! Incredible & beautiful & most certainly, memorable beyond words! Fantastic, Lynn! Your photos are top rate and this looks like a terrific trip. Thanks for sharing with us. Thanks Al! Always appreciate the visit & the encouragement. What beautiful photos, Lynn. I can imagine what a wonderful experience that was. It truly was John. A definite tick on the bucket list for me! Lovely photos Lynn. There is nothing like that first sight of a wild animal in its natural habitat is there? OK there are on reserves, but at least free to roam and hunt as nature intended. 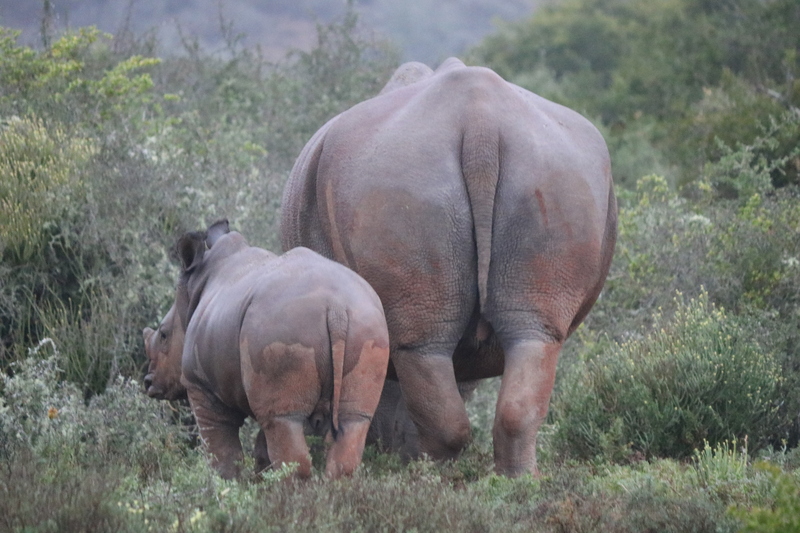 My favourite is the “does my bum look big…” shots of the rhino mum and baby followed by your lion – how wonderful to catch him staring straight at you – perhaps he was thinking of lunch? If you visit Africa again you might want to check out Namibia and the Etosha park – that is fabulous. Jude, those bum shots are some of my favourites as well. I found the lions fascinating, I could have just sat there for hours watching him, among others we saw over the few days. I would love to return some day to explore more of Africa, I will definitely keep your suggestions in the hopes I have the opportunity to visit again! Lynn!! What an incredible experience! Your photos completely reflect the adventure you both shared…not only have I dreamed of a trip like this, but like you, I would love to experience Africa with my daughter💜. Thanks for sharing, and inspiring! African Safari is definitely on my bucket list. Thank you for sharing these brilliant photos! You won’t regret it if you go Donna! Thank you so much for the visit. Holy Swooning Wowza! What an amazing experience!!!!! 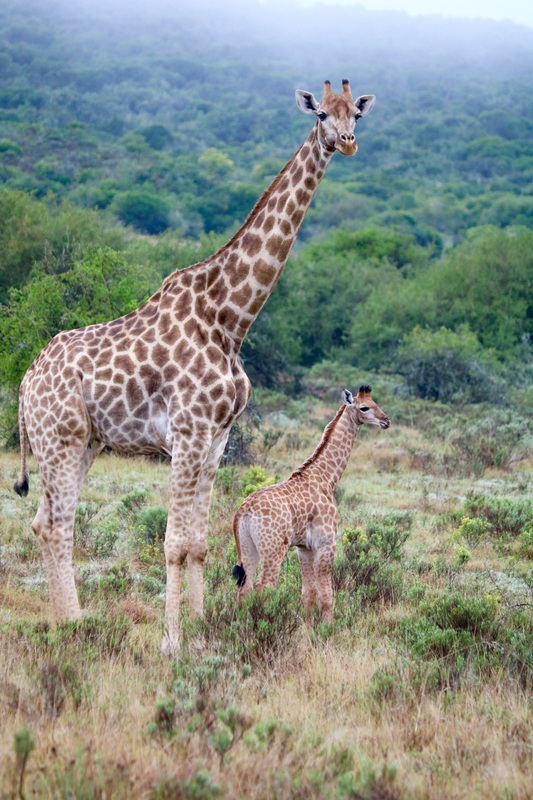 Oh the baby giraffe…. Stole my heart – especially shown next to mamma! Oh I loved every single photo in this post. How lucky for you to experience this and thank you for sharing!! Jodi, both my daughter & I could barely contain ourselves when we spotted this little fellow. We then watched him run out to his Mama & his cuteness overload tipped the scales! They both stood there for some time, allowing us to catch a few good shots of them. So sweet! Jodi, was over visiting you this morning, reading your beautiful words but for some reason your comment box does not seem to appear on that post. Thanks Lynn. I turned comments off on this one just for personal reasons. Thanks for your thoughts. Much appreciated. Joanne, it is one of those experiences that I think will forever stay with us. I have a few more pics to come, including a few more male lions. They truly are so majestic with their big manes. Love your description of being-off-the-chart cool! Looking forward to more. You take great photos – wish mine were half as good! Going on safari in Africa was probably the highlight of all my travels It is an incredible experience. 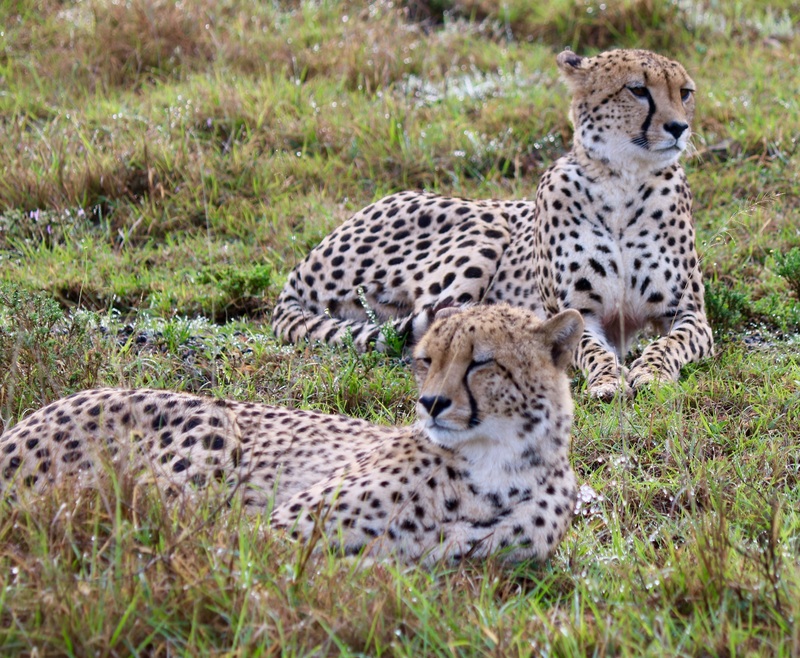 You got to see Cheetahs! Nice. It was so amazing Lynn! Such beautiful pictures. I am sure it was! What great shots! This sounds like a bucket list trip for sure. Years of dreaming of the one & totally worth the wait! I would love to go on a trip like that some day! Thanks for sharing these photos. Ann, I hope you get there one day. It is a beautiful part of the world to see! Incredible captures, Lynn! The best kind- where no harm is done 🙂 I can just imagine Sue squealing as she looked at these 🙂 The giraffes, the lion shaking his head at you… fabulous! Thank you so much Jo. Can’t wait to hear of Sue’s experience in South Africa, it is an unforgettable one, that’s for sure! 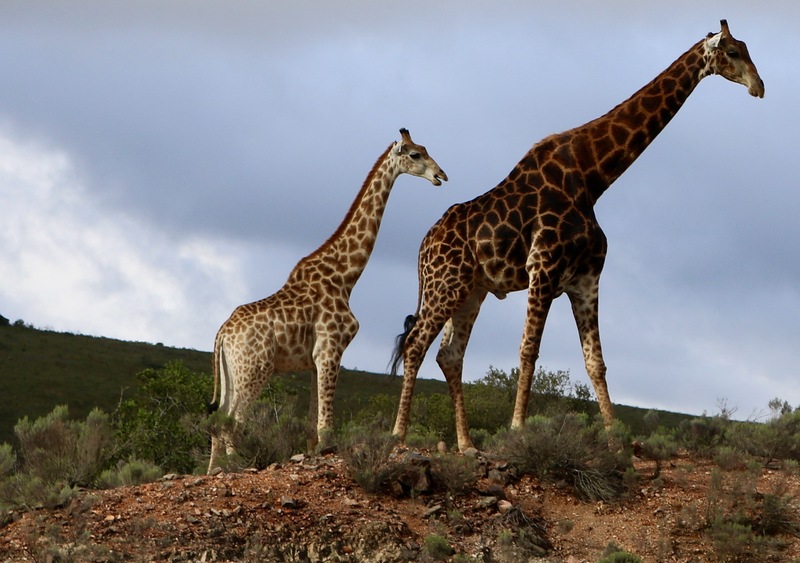 Stunning photos….hard to pick a favourite, but I do love the giraffe against the darkening sky. One day soon, I hope to follow in your footsteps! Amazing photos, Lynn. I think this is the kind of trip and experience that really has to be seen first hand to appreciate the complete beauty of these animals and their surroundings. Gorgeous. George, it is so difficult to describe the impact of this trip. To come face to face with these incredible beings is an experience that will forever stay with me. Lynn, what an incredible experience. Another friend just got back from Kenya and shared images of some of the same animals. I cannot imagine the thrill of seeing these creatures in their own habitat. Laurie, I suspect anyone who has ever had the opportunity to have this experience would agree it is absolutely incredible. Lovely to hear from you my friend. Susan, welcome & thank you so much for taking the time to pop over for a read. This experience was absolutely as you describe, magical! So lovely to meet you here! Love this post, you obviously had an amazing day and taking home memories you will think of for many years to come. For as long as my memory stays with me, I shall remember this incredible adventure David. It was amazing! Brings back wonderful childhood memories for me. The first thing we learnt as young kids growing up in Africa and going on safaris quite often, was immense respect for wildlife and therefore not disturbing them in their habitat was crucial! You certainly got some excellent sightings and equally good photos. Beautiful! Peta, I imagine your childhood memories hold so many incredible stories. We were blown away at the beauty of this place & its occupants! Incredible photos, Lynn! Thank you for sharing! It was an absolutely incredible experience. One I will never forget, that is for certain!